This year for Christmas, I’ve been fascinated with decorations. I want to look at them, photograph them, and just enjoy them. I was browsing the Williams-Sonoma catalog and found a lovely set of Christmas plates and started drooling. I wanted those plates! It didn’t make sense. We don’t have parties or entertain. We go to our daughter’s house every holiday. But those plates just called to me. I want those plates, I said. She laughed and said, all you guys do. No, I’m her daughter. I’m taking them. My aunt was never that direct. She never ever pulled the “because I said so” card. But honestly, it was the only way to be fair about Grandma’s Christmas plates and her regular every day plates with the red apples on them. Because every single one of us cousins wanted those plates. That was what I wanted with those plates at Williams Sonoma. It wasn’t the plates, it was the comfort and memory of holidays past. It was remembering my grandmother and great-aunt cooking huge lavish meals and my grandfather coming in at the end to carve the meat and show off the meal “he prepared”. It was sitting around the children’s table, eating, and tormenting each other, trying to stay out of my great-aunt’s notice that we were getting too rowdy. It was opening up a big pile of presents, going to each other’s house, and being polite to relatives from the other side of the family who spent the holidays with my grandparents. It was being loved by family and extended family, playing with my cousins until we were overtired and when I got older, having other adults to talk to when I needed advice or wanted another opinion. I didn’t buy those plates. They weren’t really what I wanted. What I wanted was to enjoy the memories of those who are gone, but not forgotten. 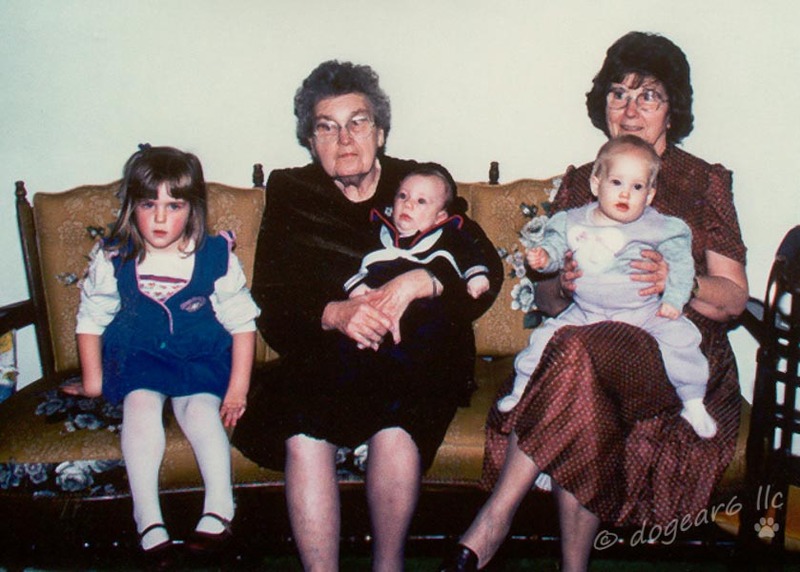 From left: my daughter, nephew, and cousin’s daughter with my grandmother and great-aunt. I know these memories are a child’s idealized version of what happened each time we got together with the relatives. But they are my memories, they are good memories, and I enjoy them. They aren’t my only memories from the holidays. My sister and I have many memories of the holidays where we are the adults and our own children were small. Now, my daughter and her husband are making their new traditions. Her Dad and I are part of the passing of the guard and the new memories to come. Enjoy your family and friends before they are gone. Nothing — not money, power, or fame — can replace your family and friends or bring them back once they are gone. You probably have delusions of immortality right now — that’s natural. At least consider that while you may be immortal, those around you are not. Top picture – my cousin, grandmother, and aunt (Grandma’s daughter). My grandmother has been gone twenty years already. My cousin and aunt live far from me but stay in touch. Middle picture – my other aunt, my cousin’s other grandparents, my grandfather, grandmother, and mother. My other aunt is still alive and healthy, but my uncle died five years ago. My cousin’s other grandparents have been gone nearly as long as Grandma. Grandpa is gone nearly forty years. My mother is still alive and in good health. What great pictures! Wish we had taken some of family gatherings. Thank you! There were a lot of pictures taken, but after my parents divorced they seemed to disappear. Most of what I have now came from Grandma’s album after she passed away. I’m glad to have gotten as many as I did. What a rich, lovely post, Nancy! I understand about the plates, and the happy memories they conjure up. Thanks Naomi. I bet you do understand it, simply because we enjoy so many of the same things. Happy Holidays to you. Hopefully your daughter is coming home from school and you’ll have a house full of people soon. We do collect a lot of memories over the years, don’t we? It’s funny how something like dishes can bring a flood of them to memory. I was surprised at it too, because I sure was having trouble figuring out why I wanted those plates so badly. It’s not the sort of thing I usually buy. Once I looked at them, I knew it wasn’t the plates I wanted but what they represented. Many of us have similar memories. I love these pictures and the memories they brought on. Thanks for sharing. Your daughter looks so cute! Can you tell she didn’t want to be sitting there? She’d just gotten in trouble and was really mad at me. I agree with you about the pictures – they might not be the best, but what they represent truly is special. Ha ha! I think all our parents have something like that for future blackmail! It was some good times, wasn’t it? Lots of good memories from that time. I, too, really love Anna’s description of Christmas being a mosaic. 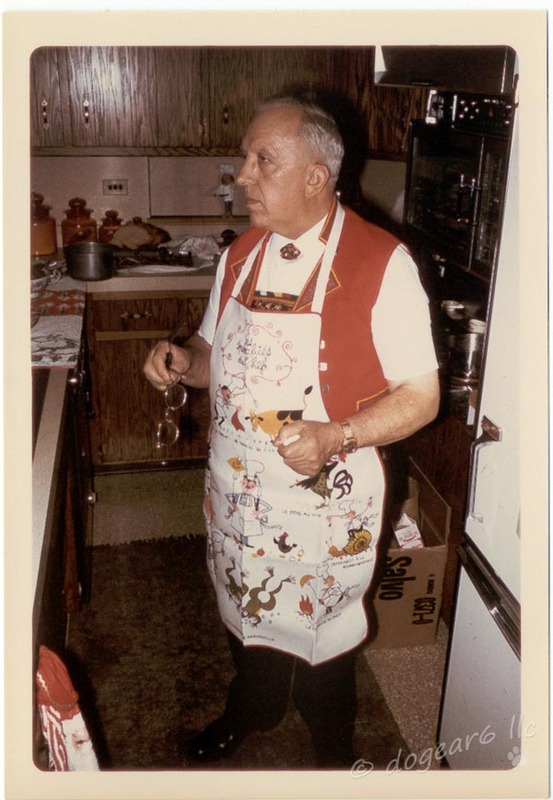 I enjoyed this glimpse into your extended family; these photos are a treasure. I like that description – falling into the moment. I’d treasure it much more, but at the time, I thought it would go on forever. I never thought it would stop one day. I know….that pretty much sums up my surprise at life! You’ve raised a very interesting subject. I think we can have very blurred memories of Christmas, of what was that once perfect time. I think each Christmas day differs, evolves and the ideal is a kind of mosaic picture of the best bits. I think you’re right that the ideal is a mosaic of the best bits. I know for my mother, the holidays were often not enjoyable due to family politics plus all the work and effort on top of her regular household chores. As a child, I wasn’t overly aware of it, but I did figure it out later. I have stuff from my childhood holidays that are best forgotten too. Not serious stuff, but not fun either. I’ve really tried to ignore that and stay upbeat about the good things that I remember. Which is why I qualified my post that it was my idealized version. In two sentences, you summarized exactly what I was trying to do (thank you! It helps me better figure out what I was trying to say). Isn’t it funny how we see Christmas from a different perspective as wives and mothers. In Australia it’s usually ridiculously hot but we still cook a turkey and have hot plum pudding. And as you said, the politics of family…. Perhaps it’s a bit like childbirth, no one would go back more than once if our brains didn’t cleverly edit out the bad bits! PS I love those black and white photos, the first one in particular seems so alive with a story to tell. The photographer has brilliantly captured the mood. As wives and mothers, we’re now the ones doing all the work and it is a lot of work! I think my Dad took those pictures with his little grainy Minox camera. I think that’s why I love the first one so much – the action and affection in it. Same thing with the last one – my great-aunt feeding my cousin and trying to dodge those little hands. I’m surprised she isn’t wearing one of her aprons, as my cousin had a tendency to spit and gag her food. The bigger thing there though is how when we all got together, we helped take care of each other. And that’s a memory to treasure.